“This seems like a nice place for a pop-up, Dad, but it might need a little more light,” says my daughter Jane as we survey the vaulted (and yes, dimly lit) space down on Hudson Street where the wunderkind teenage cook Flynn McGarry has, for the last several weeks, been making his much-anticipated New York debut. McGarry, as you may have heard, is just 16 years old and already has spent time in some of the world’s great kitchens (Maaemo in Norway, Denmark’s Geranium, Alinea in Chicago, Eleven Madison Park here in New York). 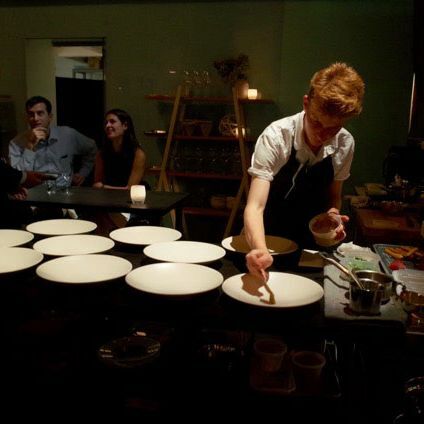 The success of his pop-up L.A. supper club, called Eureka, landed him on the cover of The New York Times Magazine last year, and now he’s brought his talents, and the Eureka pop-up, to New York. 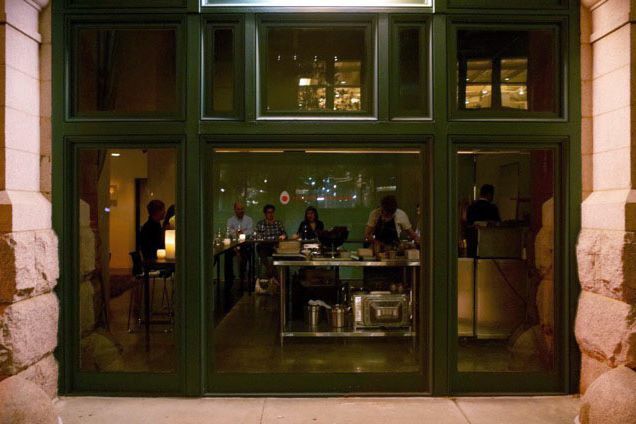 With the help of a business partner who handles the wine program, McGarry preps, cooks, and serves his own 14-course tasting menu, twice a night, for three nights a week. The cost of dinner is $160 per person (plus another $80 if you order the wine pairing), and the 12-seat bar is booked solid for the next month. Our father-daughter review team managed to wrangle two spots at a recent 9:30 p.m. seating, which Jane’s mother pointed out was perilously close to both of our bedtimes. But so what? As members of the same, precocious, food-obsessed generation, Jane and McGarry seemed like a match made in reality-TV heaven. Jane’s only a year younger than the teenage chef (he’s already passed his high-school equivalency exam), and as the eldest child of a professional eater, she has recently begun to turn her discerning eye to the world of restaurants. On a recent visit to Paris she announced that her favorite restaurant was Daniel Rose’s trendy bistro Spring (“These asparagus are spot-on, Dad”), and lately she’s accompanied her bilious father on his daily rounds, dutifully consuming bagel breakfasts (“Big is not always better when it comes to bagels”), and several marathon tasting-menu feasts (“This food is very impressive,” she whispered at one point, “but where’s the ‘wow’ factor?”). Once we adjust ourselves to Eureka’s pop-up gloom, it quickly becomes clear that the biggest “wow” factor in this operation is McGarry himself. With his skinny build and mop of red hair, he looks like an almost exact doppëlganger of Linguini, the young cook in the great Pixar movie Ratatouille, who takes the Parisian restaurant world by storm. Unlike other grand omakase chefs around town (McGarry calls himself a cook, not a chef), he preps and serves the entire dinner himself, and as he hands the first little “taste” dishes around (tiny peanut-butter Ritz crackers sandwiched with foie gras, a Wellfleet oyster flavored with chorizo and perhaps too much corn velouté), he keeps up a happy, genial chatter. Working at Eleven Madison Park is like being “in the army,” McGarry tells us at one point, but when you meet chef Daniel Humm in person “he’s a super-chill guy.” Being an L.A. kid, his go-to New York restaurant is the little East Village diner El Rey, and although he didn’t grow up eating fast food, he at one point cops to a fondness for Wendy’s French fries. Jane tastes these early dishes with a serious look on her face, then offers her considered opinion. She’s a little concerned about the proportion of corn velouté on the aforementioned oyster, but she happens to enjoy late-summer corn, and besides, “I don’t think you could make this dish, Dad.” Ditto the soft little log of kohlrabi, which is rolled in a rich, tasty substance called “cheese fat” made from melted Gruyère (“This seems like a creative move, Dad; have other chefs thought of that?”), and a medley of late-summer squash, set in a delicate mussel broth with quinoa and slices of plum. Based on her limited experience, she thinks McGarry might be “the friendliest chef in New York” (which just might be true), and he clearly has a thing for vegetables. After the squash, we sample an expertly roasted sunchoke, a beet course (“this is a four-star beet, Dad!”) and the inevitable uni preparation, which the teenage chef dresses with a slightly forced combination of coffee and carrots. Jane’s not sure about the coffee-carrot garnish (“it looks like baby food”), but she’s impressed by the novelty of the concept, especially since, as she puts it, “there aren’t many kids my age who would ever think of mixing coffee and carrots.” I’m impressed, too, although as the meal progresses, it feels a little like we’re watching a magic show, put on by a precocious and diligent young magician who’s still learning his particular bag of tricks. Because he does everything himself without the benefit of staff or a full set of kitchen equipment, the pace of the meal drags a little, and for $160 bucks, any jaded New York fresser would expect at least a nibble or two of fresh-baked bread. After all the vegetables, the grand finale is a small, round cut of 40-day-aged rib eye, which is tender enough but doesn’t taste its age. It’s garnished with eggplants and a few scraggly bits of grilled chicory, which Jane picks at, a little hesitantly, before diligently cleaning her plate.